Tokyo, October 6, 2015 – Fuji Heavy Industries Ltd. (FHI), the manufacturer of Subaru automobiles, today announced an upgraded edition of the Subaru Forester in Japan. The model will be exhibited on October 28 at the Tokyo Motor Show 2015 Press Day. The Forester has always been noted for the high degree of performance balance as an SUV. The latest upgrade advances this performance especially in the areas of design, driving enjoyment, and the utility and comfort expected of an SUV. 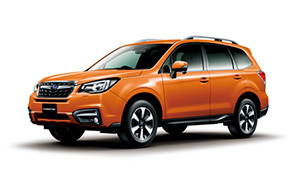 Furthermore, the Forester’s safety performance, already among the world’s highest, has been bolstered by adopting the new EyeSight*1, an Advanced Safety Package*2 incorporating newly developed Adaptive Driving Beam headlights, and Subaru’s first LED high & low beam lights and Steering Responsive Headlights. This comprehensive upgrade in vehicle performance has raised the Forester to a new level, as a product that will brighten the lives of more customers than ever. The exterior features a redesigned front face, for a sturdier, more SUV-like appearance that also hints at the advancements inside. The interior design befits the superior functionality of a true SUV and enhances the feeling of quality. For improved driving stability, the steering response has been made more linear by modifying the steering-gear ratio, giving the driver a greater feeling of direct control over vehicle movement. Suspension settings were optimized to offer a smooth and solid ride with quality feel. Additionally, a more comfortable interior space was achieved by increasing door glass thickness, strengthening the sealing, and improving Lineartronic transmission. These and other measures result in less unwanted sounds. The headlights, front grill, and front bumper*3 have a wider appearance highlighting the Subaru identity, and presenting a new front face with an advanced design that imparts a feeling of dependability. The rear combination lights adopt a sideways U-shaped motif similar to the headlights, for a sense of wideness. A lifting impression is created by concentrating the red lenses at the top, with an overall rear style befitting an SUV. The 17-inch aluminum wheels employ a sleeker pattern to reduce drag and improve fuel efficiency. The 18-inch aluminum wheels adopted for the turbocharged model, have been given a new design characterized by muscular and dynamic form. The new Forester is now available also in Dark Blue Pearl and Sepia Bronze Metallic color variations. The latest EyeSight (ver. 3) represents a major evolution in advanced safety functions. The Active Lane Keep steering assistance system, as well as Pre-Collision Braking Control and Adaptive Cruise Control, have been given performance upgrades, to provide leading-edge preventive safety technology. A package of advanced functions further enhancing safety is offered as a manufacturer-installed option. Supplementing the EyeSight front detection function is a radar system for detecting vehicles in rear blind spots, supporting safer and more comfortable driving. Radar sensors detect vehicles in rear blind spots, and LED lights in the door mirror light up or flash* to urge driver caution. Radar sensors detect the rapid approach of vehicles from the rear in the next lane, and LED lights in the door mirror light up or flash* to urge driver caution. *Both with BSD and LCA, when radar has detected a vehicle and the driver tries to change lane after using the indicator, LED lights in the door mirror flash to alert the driver of collision danger. Radar sensors detect vehicles approaching from the right or left when backing up and, if there is deemed to be a risk of collision, alert the driver by flashing LED lights in the door mirror and by an audible warning. EyeSight high-performance stereo cameras accurately detect the presence of vehicles ahead and in oncoming lanes, smoothly adjusting the range of the high beams in a continuous range by means of shields inside the headlights. ADB makes it possible to obtain plenty of visibility for safe, comfortable nighttime driving, without the need to worry about disturbing other drivers with high beams. ・Each headlight is equipped with a bifunctional projector mechanism that enables a single light to provide both high and low beams. Since LED projection is used also for high beams, night visibility is raised to a new level. ・Steering Responsive Headlights are adopted, which move the headlight beam axis right or left in response to steering wheel operations at corners and intersections. The direction in which the vehicle is moving is brightly illuminated, for improved night visibility. Greater front cross member rigidity and optimization of the rear trailing link bushings result in better steering responsiveness and straight-line stability, for more assured handling performance. By optimizing the shock absorber damping and the spring constant of coil springs, both the supple ride comfort and handling agility have been improved. Changes to the rod guide bushings and to the oil used to operate the front and rear shock absorbers result in more stable friction of moving parts while suppressing vibration. Initial roll performance has also been optimized. A comfortable ride with minimal vibration as well as outstanding handling stability have been achieved. The steering-gear ratio has been changed from the earlier 15.5:1 to 14.0:1. The quicker ratio improves maneuverability and enhances the satisfaction of agile handling. The turbocharged model adopts Active Torque Vectoring for improved cornering lines. More efficient combustion and reduced friction in the NA engine improve fuel efficiency with no loss of snappy performance. In JC08 mode tests, fuel economy of 16.0 km/liter was achieved, making the new Forester eligible for the next higher level of Japan’s eco-car tax incentives (40% reduction in acquisition tax, 25% cut in tonnage tax, and 50% off the following year’s automobile tax). The turbocharged model adopts auto-step shift control for direct and sporty acceleration. Moreover, in SI-DRIVE S# (Sport Sharp) mode, close-ratio eight-speed shifting makes for easier use of the power band in a sportier setting. Thicker door glass, stronger sealing, and improvements to Lineartronic transmission result in less unwanted sounds. *1. “EyeSight (ver.3)” as it is known on the Japanese market. *2. Manufacturer-installed option for EyeSight models. *3. The newly designed front bumper is adopted in all NA models except the S-Limited. *4. Siri is a registered trademark of Apple Inc.
*5. A Siri-enabled Apple device needs to be connected via Bluetooth. *6. Manufacturer-installed option, provided as a set with genuine leather seats. ☆: Grades shown in photo. *1 Available at additional cost of 32,400 yen (including consumption tax). *2 Exclusive for the X-Break.